 START A FIRE AT ANY TIME OR PLACE. Our fire starters are designed to work in any situation. Bad weather or good and at any altitude you are assured one of the most basic and indispensable camping requirements- a fire.  BE PREPARED FOR THE UNEXPECTED. 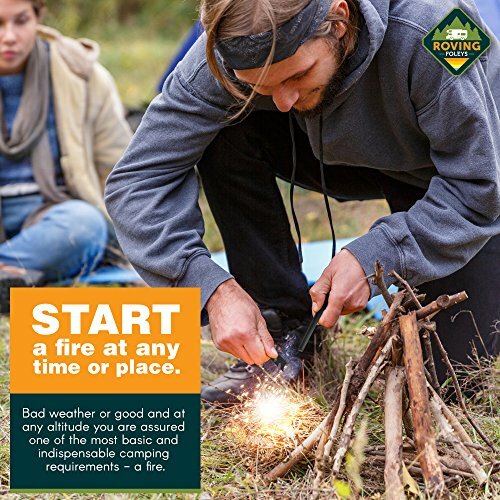 Hit the trails with pocket-sized peace of mind knowing that your “tribe” is prepared if the situation ever requires a quick fire or an unintended overnight stay in the woods. Handy on-board compass helps you find your way home.  SMALL AND LIGHTWEIGHT FAMILY FUN. 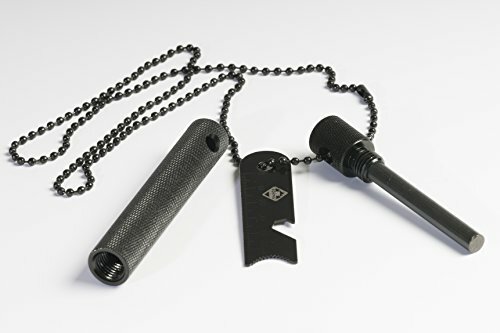 At just under 5 inches long- fits easily into glove compartment, backpack, or pocket. Keep one in each location to ensure that you are always covered. 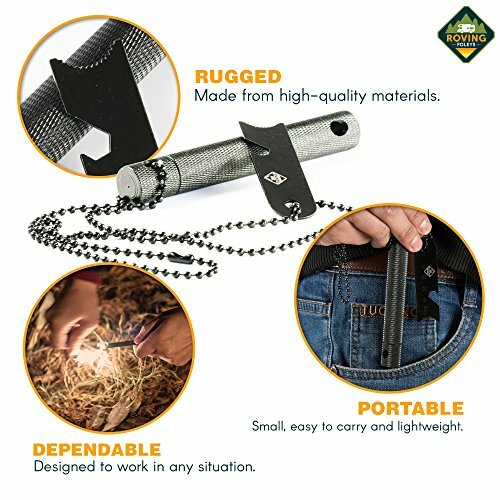 START A FIRE IN ANY SITUATION! Best Ferro Rod Fire Starter produces a shower of super-hot sparks that will ignite your tinder quickly and easily. Family fun in the great outdoors should always be based on piece of mind. If things go wrong you want to make sure you have the basic needs covered- shelter, food, water, and of course, a fire. Wet or dry our striker will spark. The magnesium ferro rod will provide hundreds of uses. The igniter case even includes a compass to help you find your way. When you need a s’more right now, you are covered! The aluminum alloy case not only protects the rod, it provides an compact package that will fit easily into any pocket or backpack. At only 3 ounces, our fire lighter is extremely lightweight. Handy chain even allows you to wear it around your neck! – Enclosed Case keeps rod dry. – Detachable metal ball chain. – Striker includes tinder scraper, striker, bottle opener, 50mm ruler. At Roving Foleys, your satisfaction is guaranteed! Demand For This Product Has Been High, So Order Now While Supplies Last!  BE “S’MORE READY” ANYWHERE ON THE TRAIL. A super fast way to build a “s’more ready” fire whenever you want one. Never get caught in the woods without a marshmallow melting heat.  PASS ON THE FIRE BUILDING TRADITION Share the basics of bush-craft with the next generation by teaching the age old art of fire building- using todays modern tools.